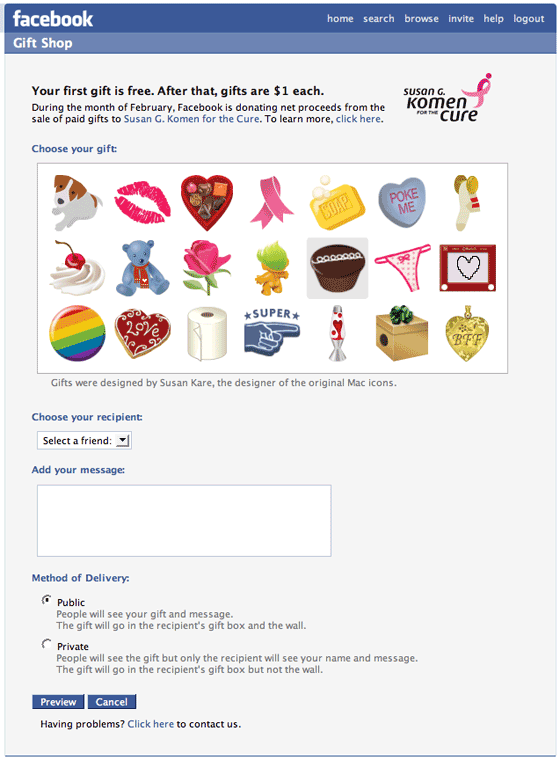 Facebook is testing virtual gifts – small icons that you can give to other Facebook members to be displayed on their pages in the “wall” section as well as a new gift area. The test is running with members from just a couple of select schools at this time. The gifts icons were designed by Susan Kare, the designer of the original Mac icons. Gifts can be sent publicly or privately (public gifts will show everyone the name of the giver, private gifts only show the icon). Each virtual gift costs $1, although right now they are free. In a brilliant marketing move to kick this off, Facebook is donating the February net proceeds from the virtual gifts to charity. After that, they’re keeping the money. I would expect this to be a significant revenue generator for them by year-end. The reason I say this is because “poking” is already such a big activity on Facebook, where you reach out to other users. When you pay money to do the same thing, it will mean more, and people will be sucked into doing it. If and when Facebook launches premium gifts, people will be buying those, too. I’d also expect them to sell really high end “limited edition” icons as well in limited supplies.